Replacing or installing a new GFCI outlet, in general, will cost similar to that of a standard outlet, with the exception of the actual part itself. As code, a GFCI outlet may be required, often where moisture and/or water is present such as the bathroom, kitchen, laundry room and garage, for example. The costs of installing or replacing a GFCI outlet will depend on a few factors, including the contractor you hire, the scope of the job (replacement vs. new install), additional repairs which may arise during the install and your geographical location. As long as there is a proper ground conductor at the receptacle box, a standard receptacle can be replaced by a GFCI outlet, according to Mehdi Heidarian at Armor Electric. However, if there isn’t a reliable source of ground at the receptacle box, then provision of ground needs to be performed to ensure the home’s safety. As a standard straightforward install, a GFCI outlet will be as easy as installing a standard 120V outlet, with the average contractor charging anywhere from $50 to $100 per hour, often with a $100 to $150+ job minimum. To put these numbers in perspective, a seasoned professional can often install as many as 10 outlets in as little as an hour as long as it’s a simple swap, not a brand new install which would require wiring. With all of this being said, the price of just the GFCI outlet can cost $9 to $20+, while the install for just one can cost $125 to $150, bringing your total to about $130 to $170 for both parts and labor for just one outlet. However, if you were to need additional GFCI outlets installed on the same day, then it’s probably safe to add about $25 per outlet as your contractor will only have a high price for one outlet due to the minimum job charges. For a new outlet location, the costs will depend on the location of the breaker and how much wiring is required, but for most jobs, the cost tends to be in the $175 to $275 range for a new GFCI oulet and location. As every job can be quite unique, we highly recommend you use the free quote comparison tool, HomeAdvisor.com. With this tool, you simply explain your job and multiple licensed and reputable contractors in your area will contact you with a free, no-obligation quote. No credit card is required to use this service. Moving an outlet: If you do not like the current location of your outlet, an electrician can move it nearby, usually for about $25 to more than $250, all depending on how far the outlet needs to be moved. As it will require more material costs, the conditions of the walls will often be the biggest factors for the electrician as he or she will have to tear about the drywall to access the wiring behind, whereas a new home that still has the beams exposed could cost much less. Rewiring: In the case of a faulty GFCI outlet, it can sometimes lead to faulty wiring that needs to be replaced and depending on the amount of wiring required and time involved, this could easily add $500 to as much as a few thousand to your total project costs. Service panel replacement: Like the wiring, the service panel can be the culprit in some cases, which can often add $1,000 to $2,000+ to your project. The same can be said about homeowners who want to upgrade their service panels as well. This is often rare but sometimes the cause of the problem for a faulty GFCI outlet. A GFCI outlet, which stands for a ground fault circuit interrupter, is an outlet which is designed to help protect you from severe electric shocks caused by your home’s electrical system and is different than that of a fuse, according to HowStuffWorks.com. This outlet can monitor the flow of the current, and in the case of detecting a ground fault, it is designed to immediately cut the power to prevent any burns or shock of anyone who may come in contact. If it senses any imbalance, even as small as four milliamps, it can trip the circuit immediately, reacting in as little as one-thirtieth of a second. Bathrooms: All outlets need a 20-amp circuit, with receptacles requiring GFCI protection. Kitchen: Two 20-amp small appliance circuits, at a minimum, to serve the countertop receptacles. 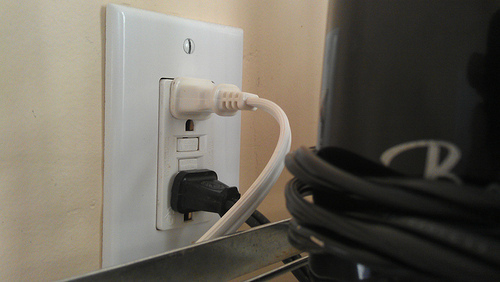 All outlets within six feet of the six need to be GFCI protected. Laundry Room: At least one 20-amp circuit for any shared washer/gas dryer receptacle, with electric dryers requiring a separate 30-amp, 340-volt circuit wired with four conducts. All receptacles in the laundry room will require GFCI protection. Garage: Will require at least one receptacle, including one for each car space. All receptacles will require protection.